Write It Right: Tips from a Professional Writing Nerd - KB Concepts P.R. By Catherine MacDonald. Catherine is an award winning writer and communications professional with deep experience in social media, media relations, graphic design and everything in between. Her publications experience includes serving as an editor at a monthly glossy magazine, managing a twice weekly newspaper and writing ad copy for National Geographic children’s books. Lucky for us, she currently shines as Communications Coordinator for KB Concepts P.R. No matter what kind of business or organization you’re part of, you probably have a website — as well as brochures, social media pages, advertising, events, etc. This means your company is in the publishing business. You want clients, customers, members and supporters to find you, glean the best information, and choose your service over the competition. While I might not know everything about how to sell the most widgets, I can provide some useful tips on the publishing aspects of your business. A “style” in publishing is basically everyone at your company agreeing to write words the same way. You’ve probably heard of AP Style and maybe even Chicago Style. Journalists follow the rules of AP Style at papers all over the country. But the New York Times, arguably the most famous and respected newspaper in the country, has its own style guide. They break from the guidelines set down in AP Style in hundreds of ways. Your organization can be like the New York Times — exciting, right?! Come up with your own style guide. Do you sell the best widgets in Washington, D.C.? Decide how to always be consistent with commas, periods, whether you write out the full name or use an acronym, etc. You like Washington, DC without periods? Fine. Just make sure it appears that way every single time. Basically, figure out which words you use the most and set some guidelines on how they’ll appear on your materials. Even non-style-sticklers will subconsciously be affected by the disorganization of an inconsistent style. Having rules about style will prevent embarrassing typos and confusion, and most likely improve the overall look and effectiveness of your website and marketing materials. Speaking of typos, proofread, proofread and proofread again. If you have employees, don’t just leave it to one person; the more pairs of eyes that check the copy before you show it to the world, the better. Don’t rely on spellcheck to catch all mistakes, and beware of atomic typos. An atomic typo is what happens when you screw up a word so badly you spell an entirely different word correctly. When “nuclear” becomes “unclear,” the information you’re trying to get across does too! Pro tip: Worried a sentence or phrase sounds off but can’t figure out what’s grammatically wrong? Read it out loud – works every time. Consider alternative layouts. No one wants to look at a big block of text on their screen. Consider the dynamics of how the human eye takes in information from a screen, pamphlet, whatever you’re producing. Try using bullet points, text boxes, pull quotes, graphics or subheads. Keep your users engaged and interested. Let’s face it – it’s almost remarkable when someone reads anything longer than 140 characters on the Internet these days. That’s why it’s vital that headers and leads are informative and attention grabbing. Standard journalism practice dictates the first sentence of an article must answer at least four of the “who, what, where, when and why” questions. This rule exists because after just a few words, most people stop reading. Be brief, informative and straight to the point. The most important guideline, above all others, is readability and user friendliness. If people can’t figure out what you’re trying to say, or how to find something on your website, all my previous tips are pretty much useless. Sometimes that means breaking style rules, abandoning creative layouts, using wordier headlines and even leaving in certain typos. Always think about how the reader is going to experience and interpret your message. If they don’t understand what you’re saying, you could lose them forever. And then what will you do with all these widgets? Great article Catherine. I like your writing style! Great tips! 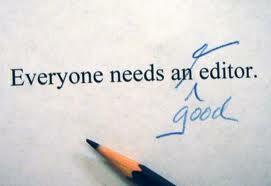 Proofreading really is better as a team effort. I can miss mistakes in my own work, but can spot someone else’s typo right away.